This post is done in partnership with Lowe’s. All opinions, ideas, and product selections are 100% my own. It is such an exciting day, friends! 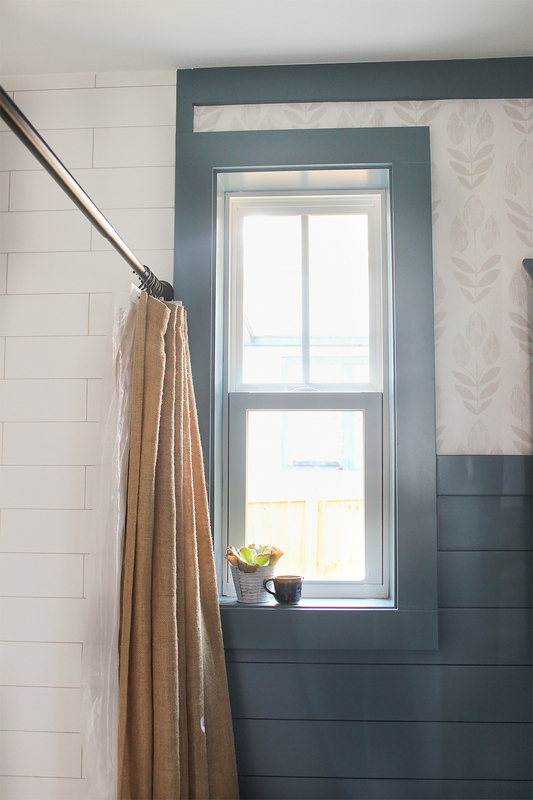 Today is our first official room reveal over here at The Buffalo Stone Cottage. 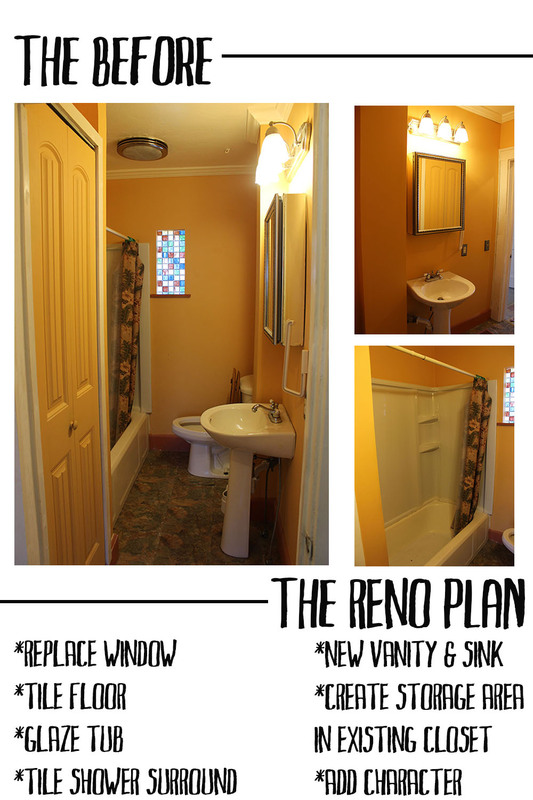 It’s been a long reno process and I am thrilled to be able to start putting my finishing touch on some spaces. This bath was first on my list to finish. When you’ve only got one bathroom in your house, having it finished and functional is a must. I am so excited to be working with Lowe’s on this part of our renovation. There is so much to share today you guys and it is going to be good! This is the seventh bath Chris and I have renovated together and I must say, it is my favorite, y’all. As I’ve said in previous posts about this space, designing baths can be so difficult. The room is very functional and there isn’t a lot of room for the layered design details I love. You have to work extra hard to give it some style and personality. My go-to’s like throw pillows, blankets, and eclectic accessories don’t easily fit in a bath, so it can be a challenge to make it flow with the rest of your home and really make it feel like you. And I think this is the first time we’ve really done that. We worked hard to choose budget-friendly options that would still add a lot of character. You can read the full design plans post here, but to recap, my vision for this space was to give it some serious charm and character. I wanted something that might be found in an old country house somewhere, but that had a fresh spin. Before we dive into today’s reveal, if you missed the past posts about this room, make sure you check those out. You can see the before photos here, the room’s design plans here, and some reno progress on this space here. Okay, y’all. The time has come. Let’s take a quick look back one last time and remember where we started! And here’s our before and after transformation! It took a lot to get this room to where it is today! We first gutted the space and thank goodness we did! The floor was rotted through and had to be rebuilt. Then it was time to put the space back together using shiplap and sheetrock to get the character I wanted. 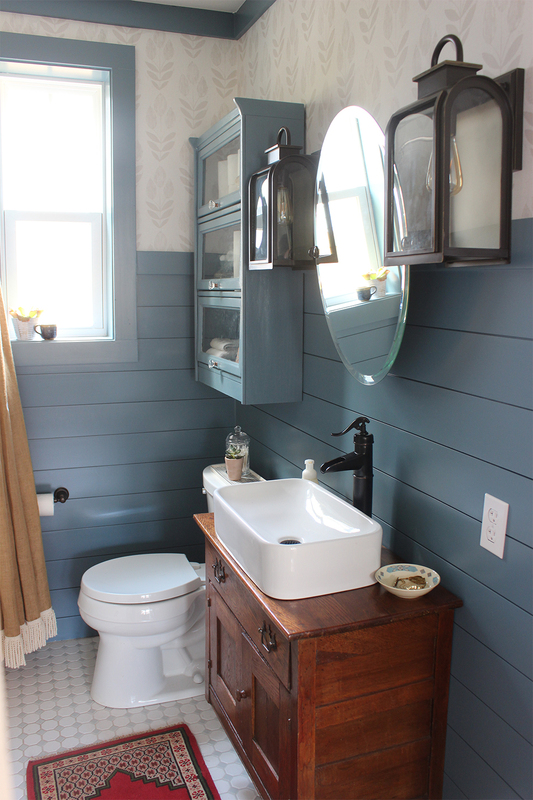 I absolutely love the colored shiplap and wallpaper combo. 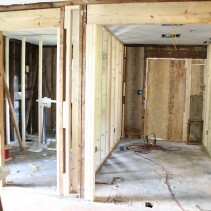 (for more details on the progress of this room, check that post out here). 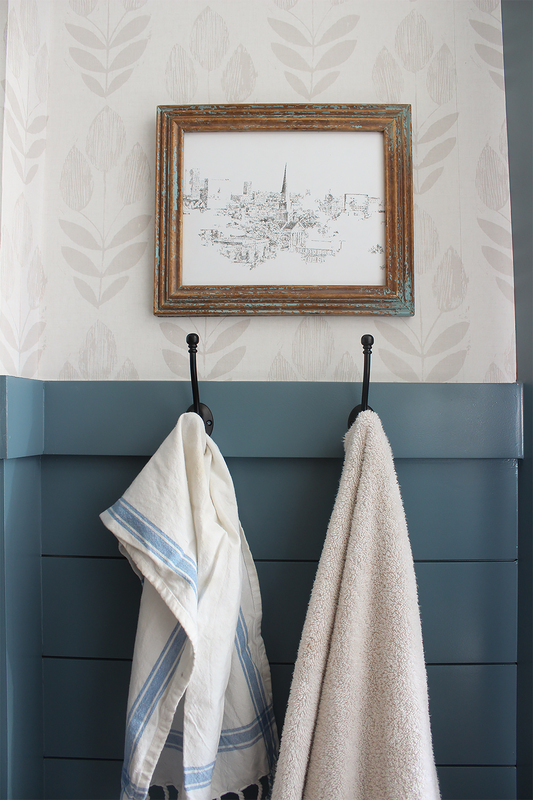 For the walls, we went with Valspar Nordic Blue and I love the deep blue gray in this space. It’s rich and a little moody without being too dark. I love that it’s blue, but reads neutral enough to go with any accent color. And it paired with that tan floral wallpaper is my favorite detail. I wanted floral wallpaper, but I also wanted something a subtle. This is the perfect mix. Now, let’s talk about this vanity area. It’s such a transformation, right? For sources, hover over this image below and then click to see all the sources we used! First up, let’s talk about those lanterns. 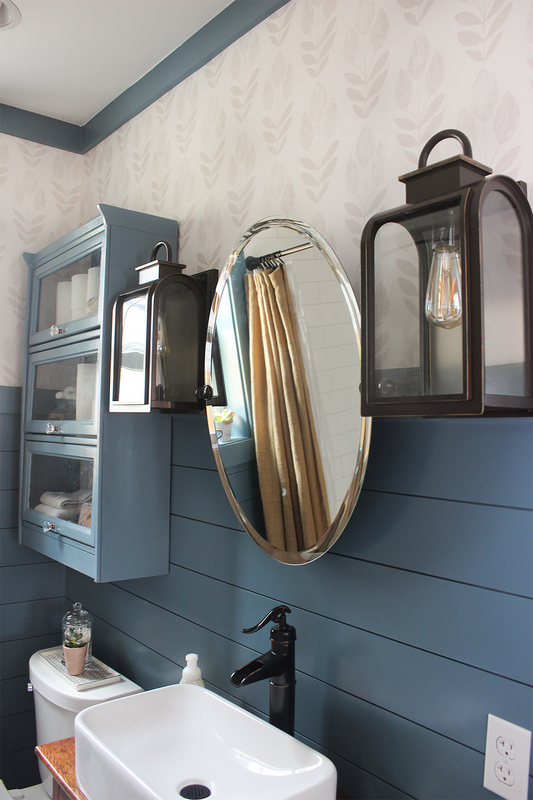 I knew I wanted to use lanterns in the space and I loved the idea of two lanterns flanking a frameless mirror. I also wanted to go with some that were a bit oversized to really make a statement in here. They turned out exactly as I’d pictured! I talked a lot about our vanity dilemma in the progress post, so I won’t rehash all of that here. 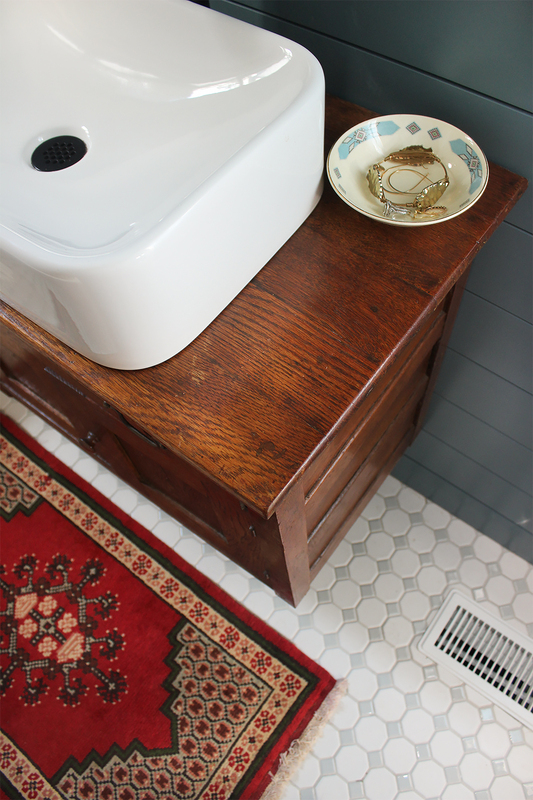 But this vintage washstand was the perfect solution! We found it at our favorite local vintage shop. I love that it brings some warm wood into the space. 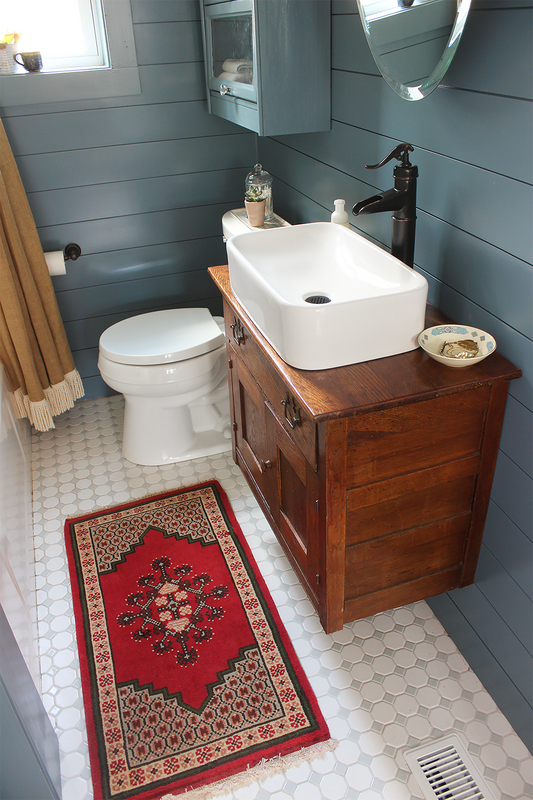 What country bath is complete without a little wood? And I love that it provides us with much-needed storage! To convert it into a usable vanity, we mounted it (as I described in the progress post) to the height we wanted. To make the plumbing work, Chris cut out a portion of the existing drawer, but most of it is still usable! So we have great storage in there and down below inside the doors. 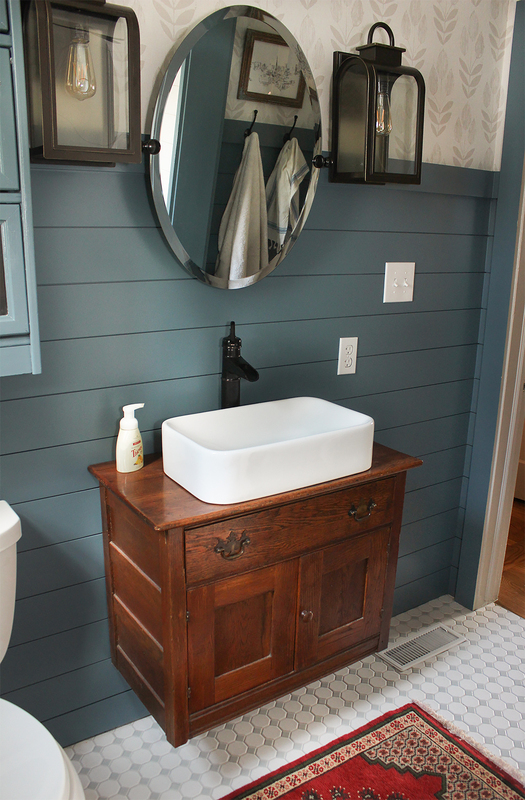 I love the updated look the white vessel sink gives this space and the water pump faucet is a fun nod to the country feel I was going for. Plus, we had that faucet in the first bath we ever designed together and Chris loved it, so it’s a bit nostalgic for us. 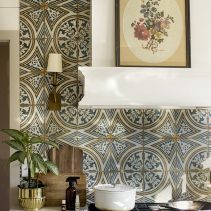 The floor tile was actually the first thing I chose in this space. I loved how it felt almost original, but the gray/tan diamonds gave it a slightly updated feel. 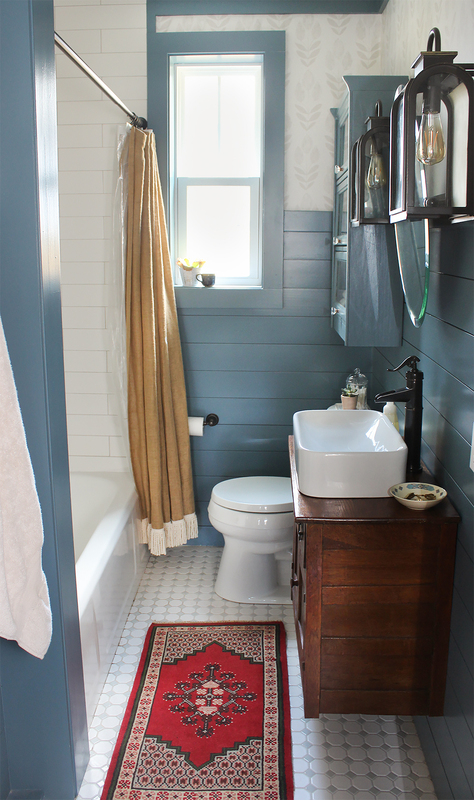 And it against that blue shiplap is just so good. 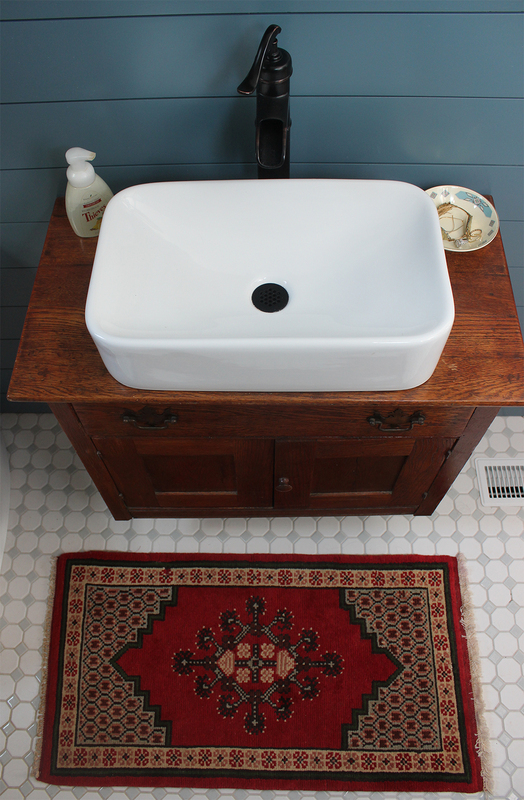 I love vintage Persian rugs in every room and they’ve made an appearance in many of my bath designs now. I’ve found nearly all of mine on eBay and I love the age and history they bring into a room. I’ve gotten questions before about water damaging them, but I’ve never had an issue! All of the rugs I’ve gotten at a great price, so there isn’t a huge investment in them. I do make sure to move it out to dry if the floor gets sopping wet, but other than that, do very little maintenance. And does it not just make the space? I love the color pop in here. (You can check out my tips for buying vintage rugs on eBay here). Now let’s talk about function. That was a huge goal in this room with it being a shared bath for the whole family. And it’s very small. I already mentioned the vanity. It has more storage than we’d thought possible with the tight space we had to work with. Most of our everyday necessities actually fit well in it! In addition, we knew that a cabinet over the toilet was a must. But we wanted something pretty that wouldn’t take away from the rest of the space. This is a really old library cabinet that we found at the same vintage shop as the vanity. We loved the old lines of it and the glass front doors. While it doesn’t provide closed storage, we knew that it would be perfect for what we needed to put in here. We were looking mainly for somewhere to stack extra toilet paper, some towels, and then some necessities like cotton balls, room refresh spray, etc. Plus, we knew it would add more character and fit with the rest of the space to have an old glass-front cabinet like this. We painted it to match the shiplap. The original wood was pretty, but it was a bit overwhelming with the wood vanity. I wanted the vanity to stand out and making it the only wood thing in the room was a great way to achieve that. Painting this blue almost makes it blend into the room and look built-in, which I loved. We installed crystal knobs on the doors (from our local Lowe’s) to tie in with the original crystal doorknobs throughout the house. 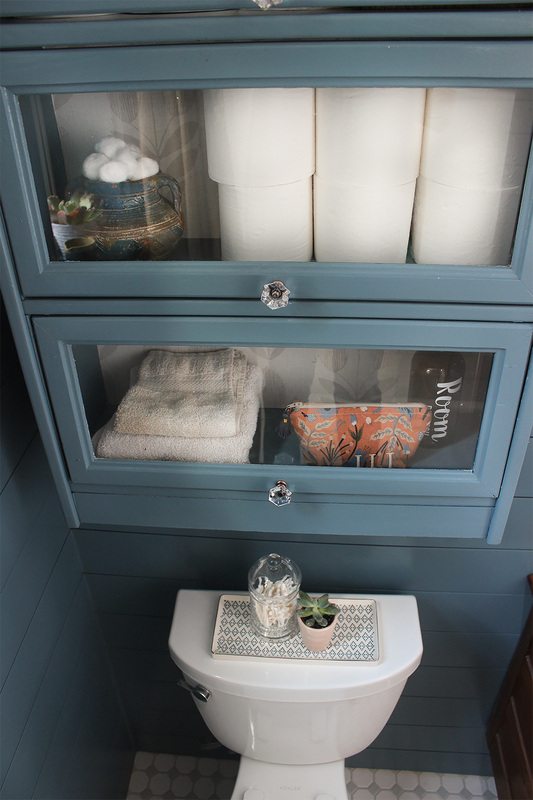 We also had the inside of the cabinet wallpapered to match the walls and I love that bit of detail. One other spot that played a big role when it came to function was right inside the door. This was a “closet” before. I use that term loosely because the shelves were about five inches deep. We knew ripping it out would open up this small space and our initial plan was to install shelves here. But after we got the rest of the room finished, we knew it would be too visually overwhelming. It would be the first thing you saw and it would close in the doorway some compromising easy clearance. 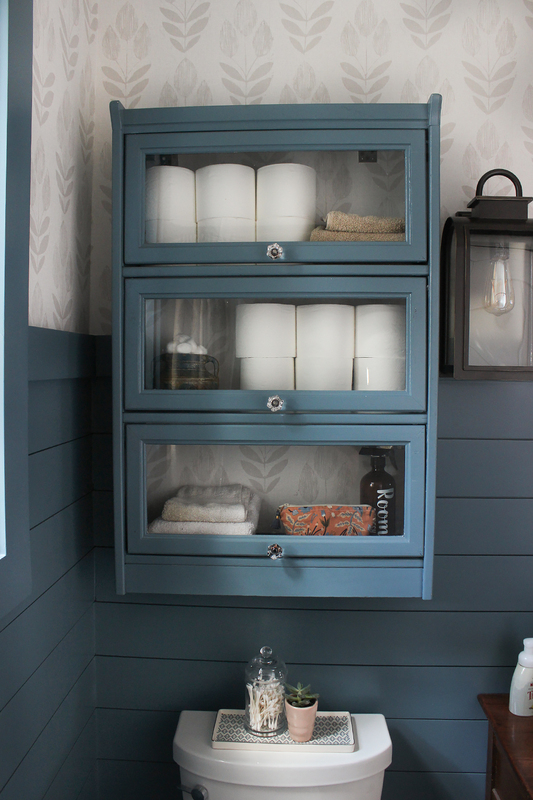 Plus, we’d realized we had enough storage for all of our necessities with the vanity and cabinet already. A couple of hooks for towels were the perfect solution. We needed a spot for that, but it also doesn’t take up needed depth right inside the door. And it left space for a little art. This is a favorite piece of ours. It’s a drawing of our downtown skyline done by a neighbor. I love having a place to display and enjoy it! Enlarging the existing window makes such a big difference in this room. You just can’t replace good natural light and now, the sun streaming in here in the morning makes me so happy. 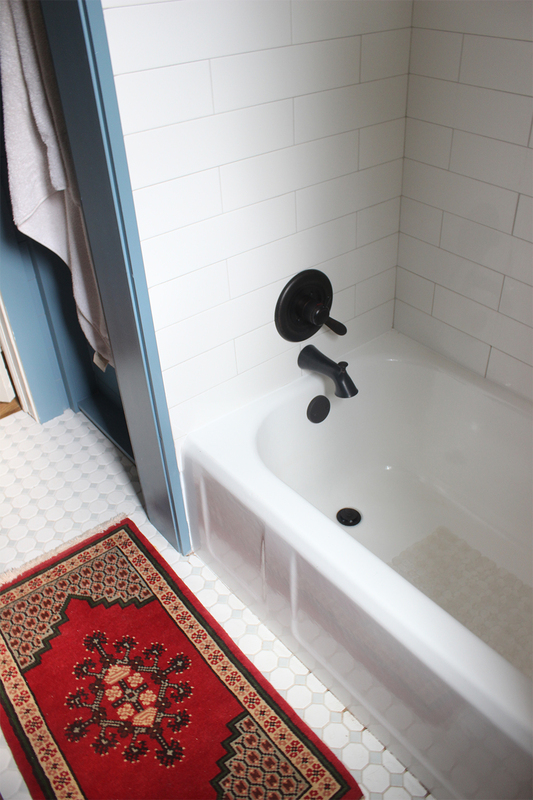 The other big update in this space was the tub and shower surround. It was so rough before. We were able to keep the existing cast iron tub and have it re-glazed for $350. 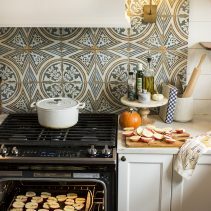 Then we used oversized subway tile for the surround. I love going all the way to the ceiling for height and extra protection from water. We used a lot of oil rubbed bronze fixtures in this space and after using a lot of brass lately, it really makes the space feel old to me. 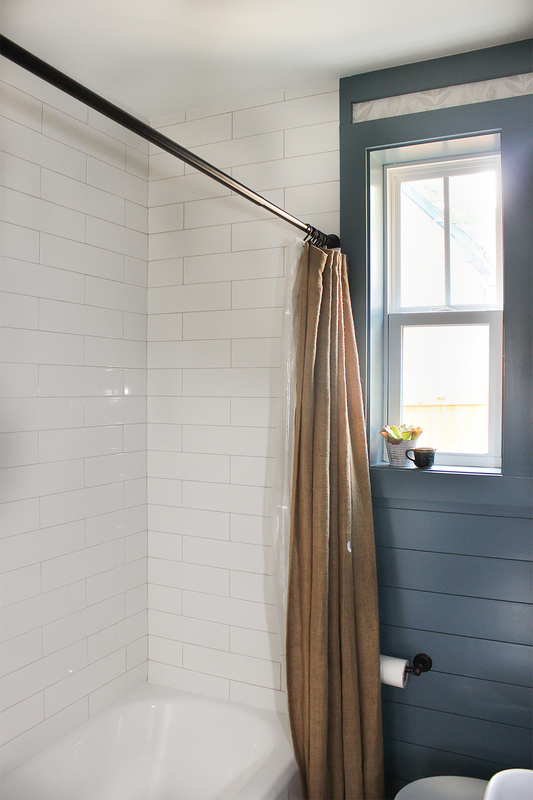 The shower curtain is another nostalgic piece for us. I bought it from Ballard Designs six years ago for our guest bath in our very first house. It’s traveled with us now through four houses and has been used in every single one! I love the simple burlap and fringe trim on the bottom. (find the shower curtain rod here). You’d never know this wasn’t a new tub! This is the fourth cast iron tub we’ve had glazed instead of replacing it and we’ve always had a great experience with it! Anytime you can preserve original materials that are as sturdy as cast iron, it’s a win-win. 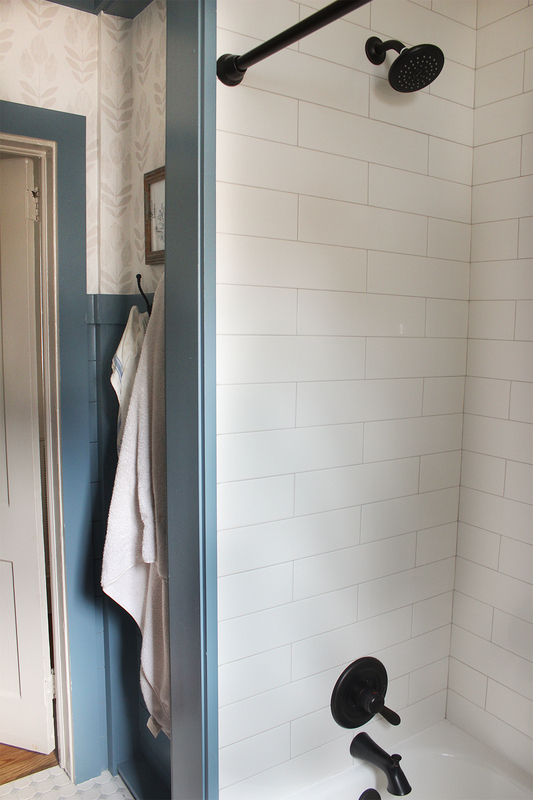 We went with a light gray grout on the tub surround and floor to create a little contrast, but also be more durable than white. And that’s a wrap on our first room reveal, friends! I made a before and after video so that you could really get a feel for the transformation of this space! For all the room sources, hover over the image below and click! A huge thanks to Lowe’s for sponsoring this room. We couldn’t be happier with how this space turned out. I find myself just coming in here to look at it and when the space is this small, that’s really saying something! It has so many pretty details that just make my design heart sing and make this a special first finished room for our family in this tiny stone cottage. It’s beautiful Lindsay! I can’t wait to see the rest of the house “reveals”! Have a blessed day! It looks awesome, very rich and yet very clean and sleek at the same time. Great job! I can’t wait to see the other rooms as you reveal them! It looks GREAT! You managed to cram so much character into such a small space without making it look cluttered or overwhelming. I love how the space still feels like it has “old bones,” yet at the same time, it has an updated, more functional and more modern edge. Such a perfect combo 🙂 Can’t wait to see more room reveals! What she said…..exactly what she said! This bathroom? is giving me some wonderful, wonderful ideas for our small second bathroom that’s going to have to be gutted. You nailed the “feel” that I want for it. Shoot, I might even go with blue to please the hubs even though I’m not a “blue” person myself. Somehow I find the blue you chose to be pleasant. Y’all did an outstanding job! Now, if you’ll excuse me, I’ve got to go pin pictures of your bathroom to my board! Thank you so much!!! Your sweet comments made my day 🙂 I’m so happy this bath was able to inspire you for yours! Looks beautiful. Can’t wait to see what you do with the rest of the house. Thanks Beth! I’m so excited to see the whole house come together! Love it!! Cannot wait to see more reveals. You always do such beautiful renovations! Beautiful! The room looks a lot bigger now that it is clean and bright. Thank you! 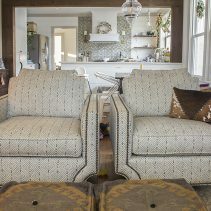 It’s funny – usually darker colors make rooms feel smaller and cozier and I was really worried about that! But this one does feel so much bigger! So so good!!!! It’s a beautiful room, Lindsay! Thank you so much, Rachel! I appreciate it so much – you’re always so encouraging! Wow! You really transformed that into a beautiful space! I love the blue and the lanterns! Gorgeous! So fun to see! Your bathroom is stunning. You chose such an eclectic use of pieces and accessories. Beautiful! May I suggest one thing? Why not paint your outlet covers the same color as your wall paint? They make paintable covers which make them look less obvious and don’t interfere with the beauty of your glorious dark paint color. Thanks for the sweet comments and suggestion Mary! I think that’s something we may add! You did a great job. It is beautiful and looks so much bigger. Hi Lindsay! This is so beautiful! I am in the process of purchasing my first house and it shares a lot in common with your stone cottage. I find myself being very interested in how you budgeted for each space and what you factor in for unexpected expenses? Would you ever be willing to share your budgets for kitchen and bathroom and how you navigate them? What you pay for help with and what you do yourself? I’m just at the very beginning of this process and I always learn so much from you! Hi, Charu! Yes, I’ll definitely be doing some basic budgeting stuff as I go on with sharing this home. Some of the initial budgeting just comes from having done several and having a broad understanding of what tile costs, etc. It also comes from having contractors we’ve used for several houses now, so we know what they charge. Contractors can vary greatly in price! So we work up a rough budget and go in with an idea of what a room will cost, but then we pick materials, etc. accordingly. For unexpected expenses, Chris always does a conservative number and rounds up on the budget lines to allow room for those things. On this house, some of those came out way more expensive and we came under on plenty so it balanced out pretty well. I’ll do a post soon trying to rough some of this out! It’s not an exact science, for sure, but I’m happy to share our thought processes! The kitchen is a big budgeting story to tell with some things we ran into and I’ll share that soon! But happy to answer any questions you have in the meantime! And I will say, we’ve ended up spending more on every single house we’ve done than we initially thought we would – I feel like that’s probably just the nature of renovating…it’s hard to plan an exact number unless you get very detailed quotes, etc. up front, which you could totally do! Bravo, Lindsey! It’s gorgeous! What an awesome start to your new home. Can’t wait to see what’s next! !